Our reality is one, and everything depends on a person who perceives or reveals it. First we reveal just a small part of reality, this world. Then, as our vessels expand and our sensitivity increases, we feel an increasingly more complex and rich reality, called the Upper World. How can we rise to the perception of a higher reality? After all, we are always talking not just about it, but about the person who receives, feels, reveals, and attains it. So how can we rise from the level of a regular person to the level of an attaining person? Kabbalists say that we can feel this addition if we begin treating our reality more sensitively, in a special manner. This is a special attitude – essentially, the realization of the importance and respect for the quality of bestowal which exists in the upper reality. And that means we should care about just one thing: how can we begin to respect the quality of bestowal, how can we raise its importance in our eyes? This is why Kabbalists write articles, books, and letters for us, giving us different exercises and explaining how we should unite so that by virtue of various efforts, the upper reality, meaning the quality of bestowal, will become very important to us. However, the main objective is not even this, but for us to see importance in the Source of this quality, the Upper Force, the Creator, the Root. When a person attaches importance to the Root, he begins to feel new phenomena. And then he understands what was happening to him before, his history. It turns out that throughout all of his life, at every moment the Creator built this process for him and a person always properly progressed towards spiritual attainment, toward the development of new sensations. This is the only thing he was doing, although he did not know about it. And now, in the present point, I have to understand that until this moment, everything was carried out by the Creator, and I have to be grateful to Him for the proper course and the impulses to move forward. But from now on, everything is up to me. We know that we aspire forward correctly when we actually see that in the past, the Creator constantly pushed us forward in the right direction. And now, at every moment, we are in the state of choice. Question: If a person gets discouraged in the process, does that mean that he didn’t invest enough effort toward love for the friends? Answer: If a person is discouraged from his spiritual development, then that usually stems from pride, from his positioning himself above the others. And this is a general disease that is found in each one of us. Pride is the foundation of the desire to receive, which comes to us directly from the Creator. The Creator is unique, thus we also feel ourselves as being unique. And I am really unique because I am a piece of the general puzzle that is not found in anyone else. Thus, I justifiably feel that I am special. The question is only is how will I use my uniqueness? Will I try to complement the others in any way that is possible? The spiritual puzzle isn’t the same as a corporeal puzzle where each piece is in contact only with a few of the nearest neighbors, and far away from all the others. In the spiritual puzzle I am connected to everyone. This is astonishing! Imagine to yourself that there are 600,000 pieces of the puzzle and I am connected to each one of them. Also each one of them is connected to all the other pieces. This is not a simple connection, but at each level, all of our Keterim (crowns) are connected to each other, at all the levels of Bina (wisdom) they are connected to each other and so on. Thus between us there is a tight connection of bestowal that we still need to discover. At the end of correction, thanks to our sensation and understanding of this complicated connection, it will become revealed in “620” times greater intensity: instead of Nefesh de Nefesh, NRNHY de NRNHY. Imagine that there was this simple system of 600,000 pieces that was connected in a series, one after the other, like a herd of sheep. And suddenly they connect in all kinds of ties, complementing and filling each other in all situations and attributes. Question: If I feel that I don’t look for pleasures in life, is this a sign that I am lying to myself? Answer: You are simply not aware of how much you depend on receiving pleasure and that you must have it. You don’t determine whether you want pleasures or not. Now you are simply in a state that you are not attracted to any pleasure. But don’t say that this is your own will. You are given certain feelings and calculations at the moment and the next moment everything can be reversed. We have to learn what we are made of so that eventually we will be able to understand and use it. If my intention is bestowal, like the intention of the Light, if I can connect to others in the group in order to attain bestowal, and through the group reach the Creator, then I will really turn into a spiritual vessel that bestows upon the Light. On the whole, there is nothing but the Light and a vessel. But I will be able to bestow upon the Light in my turn only if I yearn to be on its wavelength. If I simply receive, it is a sign that I am on such levels of development in which the Light fully controls me in every respect. But if I yearn for bestowal even a little, then I already begin to bestow, not upon the Light itself, but on the way I perceive the Light. If I can be in a state of to bestow in order to bestow, which means to relate to others and to the Creator that way, although I don’t actively participate in His revelation, I am in the Light and am not an obstacle for it in any way. I am a kind of a small material ball that is in the middle of the ocean, swimming freely in the water, not floating and not sinking to the bottom of the sea. And so even if the material rises or sinks a bit, it isn’t a foreign body. But is it possible that I could use my power that is in my connection with others with the intention of in order to bestow? But it may happen that I can no longer use my power that is in my connection with others with the intention of in order to bestow when I reveal the hatred towards others in me, a great desire to receive in relation to the group, which I didn’t even suspect earlier. Before, I had an egoistic desire on a beastly level that had nothing to do with spirituality. But when I begin to connect in the group, I first lose myself in it. This is called the transition in the level of Bina, to bestow in order to bestow (Hafetz Hesed). When I begin to take an active part in the group, I discover hatred towards it, the evil, my ego. In fact, all this exists not toward the group, but toward the attribute of bestowal itself, meaning toward the Creator. It is only felt in me, in my perception that it is toward the group. The group doesn’t exist separately from me. It is my own revelation that reveals to me my attitude towards the Creator. It only seems to me that I work with in relation to the group, but actually I work in relation to the Creator. Hatred is the left line, which I overcome, and thus I begin to work in receiving in order to bestow. I cannot skip any level, and I must go through all the necessary stages. This is an obligatory development. The Creator is concealed, and the group is concealed at first, and there is only me and my animal nature until I rise above this beast and understand that it is bestowal that is the source of pleasure. Thus I rise to bestowal in order to receive and then gradually I move on to bestowal in order to bestow, from zero to one hundred per cent. It all depends on my calculations. Bestowal as the general population sees it is helping others, which brings a person satisfaction, decorates one’s life and “fuels” him. A person assumes that thanks to this our world becomes a better place. Accordingly we can explain to people what the right connection is and what the benefit in it is. For example, in Israel there is going to be some social boycott of certain food companies that raise the price of their products in the local market while selling the same products for much less abroad. So why doesn’t the workers’ union organize these protests? Why doesn’t it organize an appeal to the tycoons on behalf of society? This will lead to lowering the prices significantly and the manufacturers will still have enough “fat” left. But apparently the Union isn’t interested in that. Comment: The union was founded in 1927 while the state of Israel was founded in 1948. Answer: The participation of the union in the foundation of the state is felt through this day. Of course, we don’t negate what happened. At first the movement had ideals, but it is impossible to “rest on one’s laurels” for so long. Question: Tycoons today are trying to erase 40% – 60% of their debt, at our expense of course. Even in the Knesset (Israeli house of representatives) they are passing a law that would rule out such an option. This means that for the first time people disagree and are unwilling to accept the “stew” they are being fed. Something is going on these days. What is going on? Answer: It isn’t about the tycoons or the poor, the unemployed or the rich. We should see the trend itself, that the Reforming Light is arranging the vessels and tying all the social classes in certain relationships. On the whole the goal is to bring a person to the recognition of the evil of the present state. A person should be “shaken” so that he will see that he cannot exist in the old lifestyle, and that he has to change his outlook of life. I go to work in the morning, make money, produce unnecessary things, waste natural resources and energy in the process, and produce totally worthless products. In the supermarket I choose from the endless variety of cheeses. All that is because my boss, with the help of good advertising, knows how to push these products to people, thus adding a few more zeros to his bank account, which he doesn’t even use and they just sit there in the bank. The more money the tycoons make the more it means that we are “growing” and that our economy is “flourishing.” It isn’t clear who is flourishing. I am not even sure the business owner is flourishing; after all, he doesn’t know what to do with all his wealth. Ultimately, It is about an inner feeling: an inner impression and a feeling of control over others; a certain sense of security money gives. Eventually, it is all about a feeling. And we will do anything to feel more secure; to feel control, self-respect, and self-worth. This period is over and humanity must acknowledge that the present paradigm has ended. Therefore, we go through phases of recognition of evil, but the process is delayed; governments hide the crisis and promise to turn things around. In the meantime an explosive mixture boils ready to blow up; economists recognize this. In the coming year we will see how things develop. On the other hand, this development must be gradual because the Light arranges everything, not anyone else. That Light is arranged so that the general population will rise above their outlook of life. There is no other choice. It is impossible to ignore half of the seven billion people “as if” they are not developed enough. It is totally untrue! Everyone, who has a human form must participate in the life of the general vessel and together reach the end of correction, Gmar Tikkun. Whatever you say, and no matter if it seems that a person cannot develop, understand, or feel, in spirituality he may be closer than you are. He is surely closer than you are because he has fewer barriers than you do. You have many calculations that he doesn’t. His calculations are much simpler, and he is much closer to correction. It isn’t easy, it is hard to explain what “bestowal is, even to those who are willing to listen and who agree with you. They think: “Smart guy, but not so down to earth,” “He speaks so nicely, but. …” This means that they listen to you and agree with you, but in the end they applaud and go home as if they heard nothing. People aren’t ready internally yet; the Light hasn’t influenced them yet. It has to go through many actions. We can see it in ourselves: We hear it every day and it is still not easy. Question: In turning to the world, we say that the solution to all the problems is in connection. Will we ever be able to explain to people what it is so that it will be clear to a person how to connect with others? Answer: You are asking: When will the vessels discover the right attitude towards the Reforming Light? How do we explain to people that unity is the solution? We go through spiritual development. The Light shines upon the different stages of development and we are under the stages. On the first stage, the vessel feels itself in the form of the inanimate, then in the form of the vegetative, the animate, and the speaking. Thus a person begins to feel what is specific to the level of the “speaking.” He discovers that he is in a society, in a mutual global relationship, in a “round” world. Inside he is ready for that and the external influences bring him to the feeling of an integral world (∫) between the limits of zero and infinity. This picture includes everyone, with no exceptions. Then a person discovers that there is no other choice, and that he must connect with others. What is more, it is worthwhile for him to connect because his life becomes safer and more successful this way and it also helps the environment. Thus a person begins to appreciate the unity. Many in the world will die without unity. For example, inhabitants of big cities will not survive if they stop providing different services to one another. Actually all the people in the world are connected this way. This is the human level; it is revealed as a single, unified system (1). You are asking, “When will we be able to explain to people the advantages in connection and unity?” it isn’t easy, because it is a gradual process. 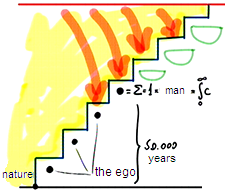 On the previous levels, humanity developed for about 50,000 years; before that only nature took part in the process. From Above the Light operates on us. If we want to intensify its influence, we should prepare the vessel for it below, then changes will take place. Our explanations today do not achieve the desired effect. We must convey to people a certain level of equivalence to the Light. For example, when we bring our ideas into the protest movements, it is good. On the whole we should form from the general population as many groups that resemble the Light, which means that they will carry our ideas to some extent. In order to do that we print pamphlets, signs, newspapers, etc. On the whole, don’t ever calculate your actions. The question is: “What should I do so that the Light will operate?” Then you won’t go wrong. We don’t do anything by ourselves; we can only organize and place ourselves under the influence of the Light. Question: In the convention in the desert we wanted to receive such energy that would enable us to reach connection. I think we actually succeeded? Answer: I think that the convention was special since we’ve achieved a certain level of adhesion, and the Reshimo (reminiscence) from it remain in us, in the whole group and in each of us individually. What takes place in spirituality doesn’t disappear, and this Reshimo symbolizes the spiritual vessel among us. Everyone feels it to some extent, more or less, but this vessel already exists. It has already been born! But in such a way that we have to make some more efforts in order to clarify it, to reveal it, and to feel it more and more clearly. We should relate to this general vessel as to the Shechina (Divinity), to the place for the revelation of the Creator. The stronger we connect, the more contentment we bring Him. Thanks to our connection, the connection of our desires, we can bring the Creator contentment and so we begin to feel the Light in our desires, and accordingly we will feel our spiritual ascent and the revelation of the Creator to the created beings. We should be more sensitive, pay more attention, and treat more subtly the general feeling that was born inside us. None of us should stop for even a moment in one place. It all depends on changing the intentions and not on the number of actions. This means that it depends on our attitude toward the connection and unity we’ve achieved. We have achieved unity and have created a vessel, and now the question is: “What do we do with it now?” This is the most important thing: a qualitative change in our work with it. This is the clarification, the search for a permanent solution. You will have to think about that yourself. If I tell you about it now, I will be stealing your exertion. It is like bringing a child a box with a Lego toy and then pushing him away and starting to put the Lego blocks together myself. Where Do We Find The Key To The Gate Of Tears? We must not be ashamed of weakness, thinking that weakness can cool our desire for advancement. There is a “gate of tears” on every step, which only opens after the realization of one’s own helplessness. And how could we even have the ability? After all, advancement happens through additional power of bestowal. We do not have it; we must acquire it. This is why I am right to discover that I have no ability to advance. And I am also right to discover that I have no desire to advance. What happens next? Just one thing: the right appeal to the Creator through the group for Him to correct the connection between us is made. And then, each time this is done, a new stage of our unity becomes revealed. This is why having a group, which constantly awakens the person, is a necessary condition. And for this reason, when a person does not know how to advance and becomes desperate the person’s pride is usually to blame, thus he is unable to receive support from the group. There is nothing to be ashamed of here; the person just needs to work with it. But essentially, this is the only disturbance. There is an enormous strength in the group. Like in the tale about Rabbi Yossi Ben Kisma. He was a great Kabbalist in his generation, and his students were very simple people. But he received a lot of strength from them since he knew how to work with them. And he was a great person! And this tale speaks of small people. This is why when a person says that the Creator is not helping him, it is his pride speaking. How does it manifest? It is in his inability to cancel himself before the environment to receive the value and greatness of spirituality from it, and to then perceive the power of the Creator who helps him and the realization of the greatness of spirituality. This is why there is no reason to cry over disturbances. It is written: “My soul shall weep in secret” in concealment, in darkness. Crying is good, but everything depends on what you are crying about: Do not cry over not having help; there is help. You need to cry over the fact that your pride is not letting you lower yourself a little before your friends, the Creator, and receive help from them. Question: I made all the effort to connect with my friends at the convention, but I failed. When it started raining in the middle of the night, I asked the Creator why He opens the skies but will not open my heart? It must be because I “did not ask for it”… So what should we do, continue these exercises or already understand that we are unable to connect on our own and must turn above for help? Answer: How can you turn above for help if you have not yet become disappointed in your efforts? What if instead of becoming disappointed, you manage to connect? Every moment you will continue becoming disappointed; these disappointments must open before you in the forms of your broken vessel. Disappointment is not given to torture you and make you creep on your knees to cry out with your last breath to receive help from the Creator. This is not the purpose. It is a known fact that you cannot do it on your own, but you must gradually collect these disappointments to discover the depth of your desire this way. They show the depth of your spiritual vessel; this is why you cannot escape them. The Creator collects all your efforts and saves them until the day, the special state, when they all collect into one whole vessel. It is like saving money in this life, adding a dollar at a time. In our spiritual life, you must also collect your disappointments, your failed attempts, and learn from the way they all add up. But you must keep all this inside you, and appear full of strength to the group. You must be so meticulous and put so much effort into collecting your disappointments, like a small child putting money in his piggy bank. They will later give you the flavor because “the benefit of the Light is attained in darkness.” You gather and collect these dark moments, which at the end connect in all different forms into such darkness that you are able to distinguish the Light. Light itself does not have a form—just the vessel you build for it. Opinion (Peter R. Orszag, vice chairman of global banking at Citigroup): “A weak labor market, like the one we’ve experienced since the financial crisis in 2008, imposes enormous stress on people. Given the added anxiety created by a weak economy, you might think life expectancy would decline. Oddly, though, during recessions, exactly the opposite tends to happen: Life expectancy rises. “The age-adjusted death rate in the U.S. declined by 2 percent from 2007 to 2010, according to preliminary data from the Centers for Disease Control and Prevention. As a result, projected life expectancy at birth rose to 78.7 years in 2010 from 77.9 years in 2007, an increase of 0.8 year. In contrast, from 2004 to 2007, when the economy was much stronger, life expectancy rose by only 0.4 year. “These cross-state data are consistent with historical patterns that economists Douglas Miller, Marianne Page, Ann Stevens and Mateusz Filipski have found. Their research shows that a one-percentage-point increase in a state’s unemployment rate is associated with a 0.5 percent reduction in the state’s mortality rate. My Comment: To eliminate suicide, it is necessary to give a person a feeling of happiness. The universal network of integral education will create the best conditions for human health.